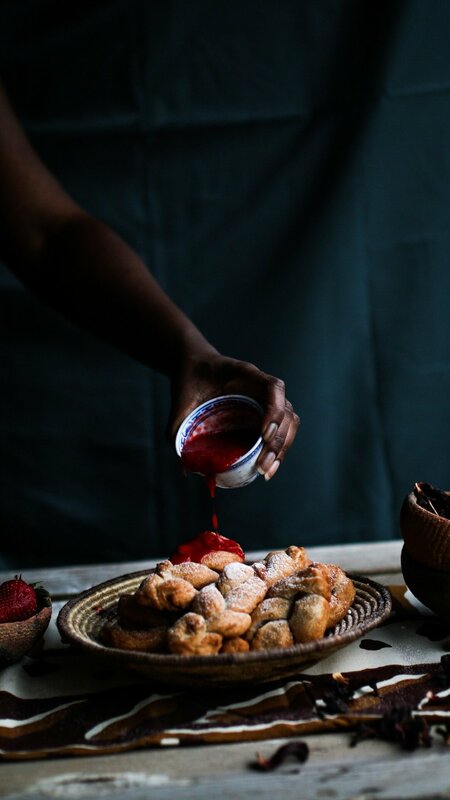 A Nigerian classical sweet dish with Austrian seasonal Strawberries. It can be eaten any time and is a classic in Westafrican found at any corner of a busy market, street vendor or supermarket. I love combining traditional fruits that are unique to one region of the world with classical African recipes. Nigerian Chin Chin is another of these classics. Eaten widely around Nigeria and a common snack this bakery is not only my favourite but my fathers as well. Which is way I made these simple & enjoyable sweets for fathers day. Strawberries on the other hand are distinct to the Austrian region. Usually harvested in mid May, these seasonal red fruit hits the markets around Vienna in May and June. Sometimes its hard for me to wait for this delicious fruit and get tempted by the imported Italian and Spanish strawberries that arrive already in early april and February. But of course local fruits don’t compared to the imported ones. Chin Chin on the other hand can be bought all around Nigeria at Markets from Street Vendors and even in supermarkets. Depending on were you buy them or who makes them they can vary strongly in taste and shape. I think the shape of Chin Chin is the most interesting aspect of the snack. As a child growing up I knew these Sweets as little squares but another common form are long pasta like looking chin chins. The old traditional version is the one I made here for fathers day. In a twisted form reminding me of a traditional Austrian bread called braided bun. I love combining traditional fruits that are unique to one region of the world with classical African recipes. Nigerian Chin Chin is another of these classics. Mix all the ingredients together and let it sit covered for about 30 Minutes. Fill frying pan with oil until it is half full, then form/twist the Chin Chins and drop them in the Oil. Fry each side for some time and let it cool. Put dried Hibiscus in the Water and let it soak for 1 hour. Then drain and add sugar. Bring the Hibiscus to a boil and add the very small cut Strawberries. Cook until the mass thickens. Tip: Make sure to fry the Chin Chin long enough to make sure it is well done. It has happened to me that I did not fry it long enough and it was raw inside.